A massive crowd descended on Government House yesterday [July 15] to protest the Governor’s decision over the Commission of Inquiry. 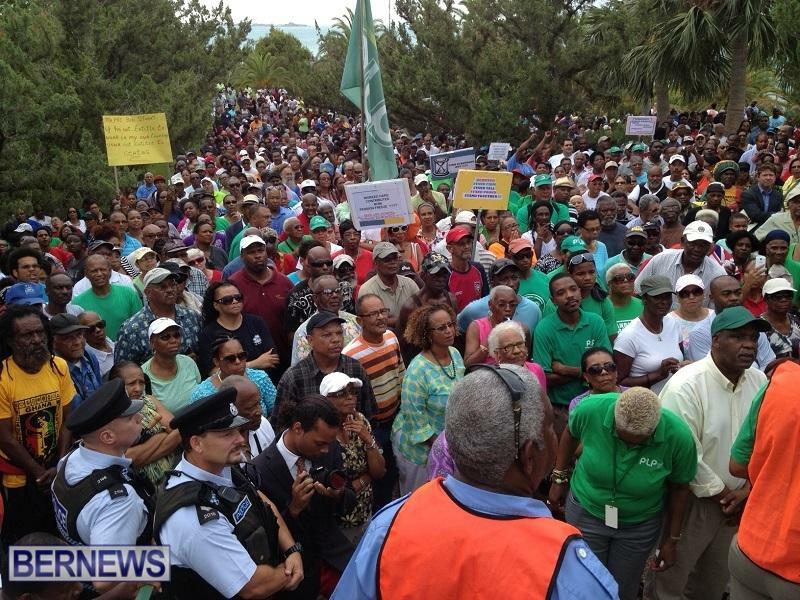 Crowds gathered outside Government House and made their way towards the grounds where they presented an 8-page document outlining their grievances to Acting Governor Ginny Ferson. That’s what the UBP said in 1998, 14 years later they had to change the party name to OBA. Oh and don’t forget the puppets they placed on the front lines just to secure more black votes. You ever wonder why at Cup Match we only see one segment the the community up there on Friday! Oh yes sorry, I forgot Premier Dunkley is always there. It will not work next time UBP!!!!!!!! It was a bigger crowd than expected but look at the age of the marchers. I think the younger generation can see through the spin and politricks. It also suggests that there is hope for healing in the future. Yep, PLP people……. through and through out. So what your saying is that Cup Match is the most important reflection of how the community will vote? You will not receive all or any of your pension despite paying into it for years! There is a real possibility that the Government could become bankrupt, which means approx. 5,000 jobs are in jeopardy unless we stop the bleeding. The costs of healthcare are inflating at a staggering rate due to an aging and more unhealthy population. But your beloved party is more interested in emotional issue from 90 years ago that they failed to address during their 14 years in power. If the PLP regain power at the next election, Cup Match could well resemble the Hunger Games in future. March 19th, 2011 – Junior Environment Minister David Burt told the Senate of Government’s sympathy for descendants of families who were forcibly removed from Tucker’s Town in the 1920s. However Senator Burt argued it’s now Government’s job to look after the people of today meaning it needs to try to revitalise tourism with the Rosewood Tucker’s Point development. Anti-racism group CURB had objected to the Special Development Order for the hotel’s expansion, pointing to the history of the site, where dozens of mainly black families were evicted more than 80 years ago in the interests of tourism development backed by Parliament. Opening yesterday’s debate in the Senate, Sen Burt said Government “hears and understands the cries” of those campaigners. Fantastic Post. Finally someone has bothered to do their homework. Laverne also made comments that they could post up…was on a previous article. Right on target with statement of Statesman Reginald Burrows, former PLP Member. But we know what the real agenda is! …. Do you not realize that the PLP are demanding the recall of the Governor for doing his job correctly. He can not act on a motion to call an inquiry if the conditions of that inquiry are not satisfied in the motion. The PLP can not sag they meet with the Governor to discuss additional details of the inquiry, without putting them in the motion to begin with and having those details passed through the house. The Governor also cannot allocate the funding for this commission, as he has no authority over the country’s financial handling, so again those details need to be in the motion and passed by the house and the senate. The PLP have lied to us, the Governor took the only action he could in response to the motion as it was the PLP’s failure to, once again, put together something before the house that could do what they stated it was meant to do, something that was doomed to fail by their own hands and no others. They lied to us again when they called this march a protest for democracy and that all were welcome, then turned it into a PLP rally for independence. The lied even further when they talk about how this motion was passed unanimously, 15 votes out of 36 is barely a 40% representation, and the only reason nobody voted no for it, was because those that had voted for to it’s amendment, were not allowed to vote again as they had already cast their objecting vote. So in effect they voted no it is a flaw in our parliament that they could not actually vote again on the motion proper. It reflects as the most disgusting of moral behaviours that the PLP would use such a highly sensitive issue for nothing more than another attempt at political gain. They have become that which they profess to stand against, nothing more than just a new oligarchy of self interest, only this new oligarchy nearly destroyed our country for our children with their inability to actually govern for the people. A massive crowd of noise makers!! It just baffles a sane mind, when you stop and think about the fact that ALL those people were HURT more by the very party that they are there supporting, than by any other event in BDA!!! And they can’t see it because of race???? Another sad day for BDA!!!! Beany is suggesting independence and those fools are cheering??? I long for the day that it happens so I can watch from afar the starvation of those that think it is the right thing to do???? Don’t really look forward to watching anyone starve? Nobody is gonna starve Girlfriend.I would say Market place Lindos BNV exempt companies insurance companies would be the ones to fold baby.You know full well about folding. I have food for you to buy sweety. And don’t worry about gas because I have the cooking oil. That’s why Bermudians are Xenophobic because of comments like that, instead of helping de Island recover you gather up your belongings and flee like fat RATS to de next green pasture of opportunity, but good riddance take you and your meal ticket and us who are BERMUDIANS would help to recover and when we do don’t come the F! @# BACK !!!!!!!!!!!!!!!! Hey dum dum, I will never put myself in a position that let’s the type of thinking such as yours control what I have worked for!!! And believe me, I am not alone, so while we take our money with us, all your type will have is raw flesh to eat in the end!!! Hope you get used to it, I prefer mine cooked, that is the point your type miss??? When Bermuda has no $US dollars earned or brought into the island which, will make it impossible for you that is left to import anything??? Well, what else can I tell you??? Get it yet??? If not, study what happened to Jamaica!!! Enjoy your lack of travel while you are at it!!! You seem to always bash others for their spelling, yet you refuse to acknowledge yoru own mistakes. Dum Dum is spelled this way – Dumb Dumb, you dumb dumb!! You seem to always bash others for their spelling, yet you refuse to acknowledge your own mistakes. Dum Dum is spelled this way – Dumb Dumb, you dumb dumb!! And I guess that right there sums up your attitude regarding Black Bermudians. I was going to make a comment on Facebook but quickly realised that some of my clients are Facebook friends. I sincerely hope they don’t see this. They support too many Bermudians and if clients pack up and leave there will be no jobs for them. These protestors went to protest the fact that the governor said that in its present form he would not call from an inquiry into a 100 year old issue. Now we have a rally cry for independence. Is that what the people were marching for or did they get fooled again? Exactly, 2,000 people just got duped……. What started as a march to protest an infringement on Democracy (which was a lie as the governor NEVER said he would not act for a commission; only that due diligence was required to CLEARLY state the make-up of the commission), to a call for Independence?????? Now we see the actions behind the request to have the governor recalled. 1. Can Bermuda achieve independence and be successful. 2. Will Independence erase our current debt? 3. Will Independence assist with raising our economy? 4. Will Independence better our ability to exist in today’s environment? This is the same party who has put us in the financial position we are in and the head lunatic in charge is spouting Independence? If you believe Bermuda and her people will be better off with Independence; than I can no longer debate this point as I feel the brainwash job has been completed. It is my sincere hope that the PLP continue to call for independence and that they make it part of their next election platform. If they merely dance around the issue the OBA and the press should be relentless in questioning then on their intentions. okay can you answer how being dependent fixes these issues? what is the Queen doing for us? To answer your question Mamaafrica the Queen recognises many Bermudians every year for their contributions to the country with honours. She also reigns but does NOT rule. This means that she is an apolitical figurehead. Dependance to the UK adds an aura of stability to an otherwise teeny weeny little rock in the ocean which attracts the external investment and international business without which Bermuda would be subsistent on sand alone. She recognizes many Bermudians every year, BIG DEAL, after they dissed us on de International stage, we can save de millions that we give for us being baby sitted !!!!!!!!!!!!!!!!!!!!!!!!! This s is NO game…. How did they Diss us on the international stage? They do send ships in whenever there has been a hurricane? A hurricane??????????????? What every ten years, are they de only ones who have ships??????????????? De queen don’t give a S— about us , that’s why her PEASANT subjects leave de so called mother land to come to the land of milk and honey to live a better life and receive undeserved white privilege to feel important !!!!!!!!!!!!!!!!!!! How do you think we’re going to “save de millions”? Do you think a President and entourage will work for free? No but we would know ALL de money wont go to England !!!!!!!!!!!!!!!!!!! So you admit, it wouldn’t save a penny. This is not enough to justify dependence and Britain certainly does not provide any aura of stability. This is a bogus excuse for people who are afraid of the masses. Bermuda is like a lazy old man who still wants to be taken care of by his mama — refusing to leave the nest as it were. Or (and I don’t know why this comes to mind), the slaveholder who refuses to give up slavery because, not having the brains to make money any other way, he knows he will soon go broke. It’s about time that Bermuda stops demanding to feed from the breast of Mother Britian and strikes out on her own. If Bermuda currently does not have the wherewithal to sustain herself independently then she must think outside the box and find a way. Most people understand the advantages of maintaining our connections with the U.K. They are numerous and have been laid out clearly countless times. What has never been laid out clearly by supporters of independence are what advantages we gain going that route. So let me turn this around Mama….how will we be better off if we are independent? Well…we would have our own flag to wave &…um…er…cough cough…but but…all would be well because um…er…. You don’t expect an answer do you? How many countries in the world that are now Independent that was ruled by European countries ??????????????????????????????????????????? Kunta….answer my question above. independance supporters never do. Some…but not close to all of the benefits of our u.k. connection have been made clear here. Perhaps you could also refute those. Dare I say it …none. Most other counties have opted to form new groups to be a part of so really none are truely independent. Independence is a mirage. There are only various forms of dependency and compromise. We have a very good arrangement compared to most of the former colonies who now describe themselves as independent. How many of those so-called independent countries are actually independent? Most depend on international aid and loans and must dance to the tune of those who give them money, whether it’s the IMF or Cuba or the US. Watch the movie Life and Debt to see what happened to Jamaica. How many of the people in those so-called independent countries are as free as we in a so-called dependent territory are? Most of those people have no choices other than the severely limited ones in their country. They can’t leave because their money is worthless outside their borders. Free to travel? No. Free to be educated overseas? No. Free to improve their lot in life? No. Free to express opposition to government policy? Free to do the things they dream of? no…without money options are severely limited. How many of the people in these so-called independent countries have any true voice in their government or freedom of speech? Many have non-democratic unelected self-appointed governments, corrupt governments, governments which would deal with the protest we have just seen by use of unnecessary force, politicians who are in it for themselves. Dee mentioned Grenada…there are many many more…Those people are trapped, without choices in a hopeless situation. My clients are here because we are supposed to be a stable Bristish colony. They will leave if this changes. The pre clearnace for travel to the US will disappear. All the UK passports that were issued to Bermudians will be taken back. Exchange control will no doubt be enacted again and you will need to seek permission to transfer funds outside Bermuda. You will not able to hold US dollar accounts again. Bermuda will become a third world country very very quickly. Now, what are the benefits of going independent? But not to worry…you can thump your chest and be proud. Hungry, but proud. That’s the mentality we are working with. Me think you thump your chest too much; aceboy. Also someone might want to tell them that at that point the PRC people will become full Bermudians vote and all. Are the PLP awhere of that. Under international laws related to independence there are many people who would have to be granted citizenship. I invite you to visit an Island south of us called Grenada. They are now independent and many, many islanders regret that move. Their infrastructure is poor, unemployment is high, poverty is widespread and like Bermuda they mostly rely on tourism which is very seasonal and has dropped considerably in recent years. Hurricane Ivan several years ago hit them very hard and even now, due to lack of funds, one can still see the damage done by that storm, many roofs in the capital are still not repaired. That’s what Independence did for them. Access to British citizenship, allowing folks to live, work and study in Britain. Access to live and work in Europe. Better access to countries that otherwise require a VISA. More confidence in investing in Bermuda. There are another quick few…. So what would independence give us??? Most Bermudians are not HARD UP for that , sorry Charlie !!!!!!!!!!!!!!!!!! Yes, the Masses got fooled again. We will eventually see the parting if this push the Independence issue, could be cementing the continued place in Opposition. I sure hope so. Yes, Bermuda has a somewhat negative past but it doesn’t mean we must have a negative future…The Island is in debt! It will be a very negative future if this doesn’t stop. Mr Bean is likable to… so be very careful people of what he might have in store for you all. The whole thing was a setup from day 1..ratcheting up the rhetoric over PRC’s (which is disgusting) and now this non issue. They know what they had to do, but chose to make a political statement. This is the same crowd that had every opportunity to address this issue three years ago and said it was “history”. And underneath, so much worry that we might just have the green shoots of recovery and they cannot abide the possibility. Shameful behaviour. As I read the articles about the march, i came across a sign that read (not word for word)……. This march was clearly political but the biggest issue is the idea that many of us Bermudians think that we are ENTITLED to work. Reality check my fellow countrymen/women; you have to earn your employment and work hard to keep it. We are NOT entitled to anything. I beat out 2 Foreigners for my job and that makes me proud of what I have worked for and achieved. Please, get off your lazy rumps and do something productive with yourself. I AM SICK AND TIRED OF THIS BS…. You all will not be happy until OUR islands reputation is severely damaged and we will have nothing, no IB and no foreign investments to support our economy. ALL you’re doing is damaging our reputation and I ask you all to Google reputational risk, educate yourself on what you are doing to your OWN COUNTRY. Well, this whole attempt for a commission is now an obvious ploy to push independence. Shame that the PLP is making a mockery of history and using it as a tool to push their selfish agenda. PLP and their supporters are brainless! Do they honestly try to look so stupid? Do they not realize the Governor works with our government? DUH! PLP… ruined our image and tourism! These people are being tricked into pushing a self serving power grab agenda, they are being tricked by emotion into giving up their future. It sounds very familiar to one of the complaints listed on the motion. It’s amazing how some people feel so free on this forum to insult people for exercising their democractic right to protest injustices in their country. They have the right to speak, but they need to understand the consequences. Thank God! people like Gaudhi and Martin Luther King Jr. didn’t take that advice. They did. That’s the point, it’s not meant as a threat. It means that free speech does carry responsibility. If you spund like an idiot, be prepared for people to call you on it. And stop bringing up Ghandi for Christ’s sake…Indian Socialists had way more to do with that movement than did Gandhi. Thank God people like Gaundhi and Martin Luther King Jr. didn’t take that advice. It slays me that Bean is saying that people will become Master of their own destiny. No they won’t. We’ll be subjects of his and his cabral’s destinty. How will people have more say under an Independent PLP led Bermuda? Quotes like “We don’t care what you think” and “We had to deceive you” are hallmarks of the PLP rule. They’re only in it for the contracts. They really don’t care what you think. I think you meant ‘cabal’. We’ll be subjects to wherever our debt exists. We don’t want independence. the PLP produced a lengthy report on independence which had no meritable benefits except a sense of national pride. a sense of national pride is what we already have. If you don’t have it then start working for Bermuda and realize how lucky we are. If you still don’t have it, then get your British citizenship and go live in one of those European countries for a while. It’ll refuel your pride in what you left. If the PLP want independence then they are not working for the people, as the majority don’t want independence. I think they need a kick up the rear to wake up and focus on working to get the people back on their feet, and not pull the rug out from under us all AGAIN. That would be about the dumbest thing,(the majority of) Bermudians can ever do. First of all, “we don’t have a pot to piss into nor a window to throw it out of”. Foreign investors, them with the big bucks will up-root so quickly! Oh, who will buy the oil / fuel etc. that Bermudians aren’t able to live without? Shall I keep going? Get real u’lot and stop being a bunch of dreamers that think Bermuda can / will survive “independently”. Nobody seems to have addressed the matter of finding out the facts needed for a Commission to work. As a conveyance lawyer I did some complex searches during my busy years (one in fact re the title of a roadway outside of a house owned by a close relative of Walton Brown and on that persons behalf). After that is done and presumably the property values at that time have to be determined. Was there negotiation or compulsory purchase? That would be the initial stage — a prima facie case. For a hundred thousand dollars the PLP could do that; they could get donations from rich PLP like Ewart Brown and Zane Desilva; surely they would want to kick into the fund. This appears to be a burning issue with W Brown and Marc Bean but it may be political play acting; if it is not the latter then they should do what they consider to be the right thing and put your money on it. Once there is a prima facie case even if it was not for compensation but just for the historical record, a further attempt to get a commission going would be far more likely to succeed. Just one more paragraph on property values. If my memory serves me correctly I think that the price paid by Mid Ocean Club to the Bermuda Development company was 151 thousand pound sterling; that included the golf course and the building land surrounding it. I do not know what state the parish records are in (remember there was no Land Tax then — the parish overseers collected ten shilling a year from some and say 2 pounds for the larger properties). The parish records are poorly kept on a shelf in the registry and the metes and bounds of the properties will be vague at best without further evidence. Raymond, he is very real! My husband’s family was affected by the land transactions which took place in Tucker’s Town so many years ago. So we have a vested interest in this topic. I have a huge problem with the PLP politicising this topic. They are trying to rally their base with a topic that once again places this country in a them vs. us mentality. This topic if it was soooo important could have been taken up under the PLP administration. Now there seems to be an urgency? The correct path would’ve been to sit down with the Governor upon his return and discuss it further. This is a very complicated issue. It is easy to stand there like children and demand that something be done now. It reminds me of my kids when they were 2 years old and they wanted something I wasn’t prepared to give to them. What I gathered is that the PLP has no real ideas or plans to put this country forward so they need something to rally their supporters and detract from any progress the OBA is making. PLP please step up with some POSITIVE ideas that will repair the damage you did to this country. STOP dredging up the hurts of the past, deal with the current ones (unemployment, weak economy, education). We could deal with the past once we straightened out our future. I like your first sentence,making it seem like you are looking at it from both sides then insult families who were robbed of their land and then compare them marching for justice too YOUR SPOILED KIDS who cant get what they want(I hardly believe that)That is even more insulting!! First I never insulted the families who were displaced as I would be insulting my own. I am opposed as to how the PLP is going about doing this. Before going to this extreme please sit down with the Governor and discuss it. This was not a march for justice, this was a pouting and tantrum session because they didn’t get their way the first time around. Sit down like adults and statesman and discuss the issue. In addition, why wait until now, they had 14 years to get their way on this matter. Trust me I would love for this to be resolved as my family would most likely benefit but we have more pressing issues to attend to like making sure every Bermudian is employed and every child is receiving a proper education. Why isn’t the PLP and their supporters putting as much effort into those two things as they are on this? Hardly a spoiled child at two years old. You obviously never had kids. The terrible twos and temper tantrums are pretty normal across most if not all children. The PLP said we promise, we promise. Wait a minute the march was to protest against the Governors reasoning for asking for more defined terms in the motion. If you haven’t read the Governors reply please do so. i.e. it was a match to have the governor push through a commission and to preserve as they put it”democracy”. On the day of the march the PLP had added multiple reasons for the march and had prepared a document attacking the governor on various other things. So it wasn’t the march they promised (for democracy). The PLP also turned it into a PLP rallying cry for indepence. So it wasn’t the march they promised. They ask us to believe their promises, BUT on the day they asked us, they broke a big one. The march for democracy was a march for Independence. We were lied to AGAIN. If you break promises on the day you say we promise, then you CANNOT BE TRUSTED. This was just a political rally to stir up the their base and pull in people who abandoned them in the last election. The majority have never wanted independence and still don’t, if this were not so the PLP would have held a referendum during their time in power. On a side note, PLP and its supporters, stop asking for knighthoods and other bobbles for your politicians if you want independence from the U.K. so bad. I really think something more is going on here in the background, like the PLP hierarchy trying to preempt some scandal about to hit them like a Tsunami. That theory has been put about..is it a preemptive strike….? The only commission that the Governor need appoint is one to address where all the money went during the PLP’s 14 years. This is why people all over the world laugh at us. People all over the world laugh at us?? I have travelled the world and haven’t met anyone yet.BTW please name just 1 country that can laugh at us. You traveled the world and have not met anyone. Now that is a comment I cannot figure. If this is true, how can you call yourself “disadvantaged”? As a young black Bermudian… it makes me so sad to see ‘the people’ constantly being exploited by the PLP for their own political gain. The reality is, most of the people in the crowd yesterday evening have no real concept of what democracy actually is. I did read His Excellency’s letter to the Speaker of the House and I have been scratching my head as to why the PLP are being so extreme. Then i thought about it and realised, they’re always this extreme. They stir things up to make ‘the people’ believe that they need them. Well I weep for those who they misinform and take advantage of. These demonstrations and public forums often leave me with the feeling thats perhaps ‘the people’ that the PLP are so valiantly fighting for (excuse my sarcasm) dont know whats good for them. I get it, they’re frustrated… but they’re also very misinformed and the PLP thrives off of it. For those who will assume otherwise, I do not consider myself to be an OBA supporter. I’m simply pointing at the duck that looks like one, walks like one and sounds like one too. To say that I’m saddened by the amount of people who attended this march is putting it mildly. It is so deeply misguided and misinformed that I can’t help but truly fear for the future of Bermuda. Add to it the feeling among some people in the group who felt it was necessary and appropriate to hurl racial slurs at passersby, and none sought to reprimand them for the behaviour, I wonder what has become of the Bermuda, and Bermudians, I used to know. When doors were always unlocked, violence was limited, and it didn’t seem to matter the colour of your skin, you were simply welcomed in. Perhaps I was raised and lived in a small pocket of right thinking people. All I can say is that I miss Auntie and my second Mom and truly wish I could sit at either or both of their kitchen tables and talk to them about what we’ve become. This is an exerpt from one of Mr. Beans statements..
Mr Bean continued: “Let it never be questioned that the Progressive Labour Party is here to serve the greater interests and greater good of this country. For rest assured you will always be put first from this day going forward. So where were we on your agenda all of this time Mr. Bean if from this day forward we will now be put first??????? I don’t recall any Foreigner marches ???? Please refresh my memory. Perhaps I misunderstood. I think you have the wrong meaning of the word Sankofa. It is a Ghanain word that roughly translates as “reach back and get it” or is symbolized by a bird with it’s head on backwards. The message is a good one, though, as the word implies that one should take what is good from the past and bring it to the present. @ I Don’t Think So. I don’t have the wrong meaning. Having travelled to Ghana more than a 1/2 dozen times and visited this monument where there are 11 additional symbolic meanings. Forward ever-Backward never is a shorter meaning of the long term. The bird head is back, meaning you look to the past and remember, but never stay there. The birds chest/breast is facing forward, meaning you always move forward , remembering the past , so you don’t forget and repeat the same mistakes. This info came from the professor at a university in Ghana who was part of our tour guides. So whites are not Bermudian? The fact that my family name dates back hundreds of years, that my passport says Bermudian, that I’ve fulfilled my regimental duties, all are canceled out by the color of my skin? You do know that this island was uninhabited(that means no one lived on it) before whites found and settled it right? You are doing a wonderful job keeping racism alive sir. I actually have no problem, in principle, with an inquiry being conducted. I think the topic has been enshrouded by anecdotes far too long and needs a proper investigation, if for no other reason than to expose the known and provable truth and distinguish truth from myth to whatever extent is possible. However, Marc Bean does not want the truth, but rather a witch-hunt – that’s why this is clearly a political protest in which Bean never even mentioned the real issue of the Commission of Inquiry in his soap box speech. It is a simple and easily grasped notion that someone took something from you, and that they are evil and you are good. The nuances of legislation, legal cases, contracts and processes are less easily understood. So the PLP chooses to incite their followers with the simple notions that can justify their world view. Thankfully we live under the rule of law. I actually have no problem, in principle, with an inquiry being conducted. I think the topic has been enshrouded by anecdotes far too long and needs a proper investigation, if for no other reason than to expose the known and provable truth and distinguish truth from myth to whatever extent is possible. However, Marc Bean does not want the truth, but rather a witch-hunt. It is a simple and easily grasped notion that someone took something from you, and that they are evil and you are good. The nuances of legislation, legal cases, contracts and processes are less easily understood. So the PLP chooses to incite their followers with the simple notions that can justify their world view. Thankfully we live under the rule of law. Civility must never be an option….we are in the world view….let us be who we are..
What kind of slurs? What was said ?….you must use your phone and capture what is said and by whom.As long as it is public property….private is another matter,this was a public venue in publics eye and ear…anything said or done here is subject to law! Where were all these people when every other week someone was being shot down on our streets? Where were all these people when 4 (PRC’s) were sneaked into this country by the cover of darkness,given jobs and a place to stay, when at the time there was and still is so many without either. How is it people forget so quickly? I’m for neither Party however you can’t expect any Party to fix in 2 years what took 14 to destroy. Wake Up People PLEASE!!! Here’s something for anyone to think about.. IF the plp ever got back into Government,I can tell you now,there are many people that will never abide by anything they say. Who are you to call people stupid @ wise u are an arm chair coward who really doesnt even deserve this reply .but because im ( according to you stupid) here u go . Now go clense your filthy thoughts. There are a significant number of people who seem to assume what they have been told about the land sales is true because both sides of the story have not been told. It is established that a significant land claims are not just people who have some sort of paper or deed that claims for ownership there were many individuals out at that end of the island who were what you would call “squatters”, so their claims are only like the folks who reserve their spot during the Bermuda Day Parade; they just sit at that spot long enough for it to be theirs and their grand children’s spot! The PLP leadership and MP Walton Brown do not believe in the Bermuda court system to resolve the issue because they see the legal system as the extension of Colonial oppressors; so the land issue will not be agreed to even if the court hears the case and makes judgement. When you look further into the details of the issue it gets more complicated with the issue of freedom of land ownership for freed Bermudian slaves. Black property rights should be secure like all property rights but the PLP and the OBA and previous UBP are essentially socialists who do not believe in the absolute property rights they only believe the state has the right to take your property or regulate your private property in the interest of the state. This is a continuing agitation political issue for the PLP that could last for at least 2 or more generations. For National Importance Compulsory Purchase orders happen pretty much everywhere. Road expansion, railroads Slum redevelopment, airport, etc etc. You do own your land except for the above type scenarios, where people choose not to sell for a fair market price. And here it is again “our people” not our Bermudian people – just “our people”. As plp supporters have stated “you’ve had 400 year” so no white bermudians dont seem to be part of the PLP’s Bermuda at all. @cj Its all so silly… and to think people say racism in Bermuda is dead? Its alive and well and if anyone seriously thinks that racism is simply white people mistreating black people then its far worse than I thought. Did all 2000 (or so) persons in attendance even vote for the PLP? hmm that’s why I have never seen a white gombey. Most of these attacks against the marchers, is just another indication of the level of racism and hatred for a certain group of Bermudian people. All over the world people are standing up for equality and justice, west Indians, east Indians, Chinese, South Americans, Africans, the British, the Scottish, even the Americans, protesting the 1% of Wall Street. But it appears when people of color here in Bermuda, even talk about addressing the injustices of the past and present. They are labeled as stupid, brain washed, blind sheep, and all kinds of disrespectful names, but yet some of theses same bloggers on this website and others are constantly saying, why can’t we just get along. So I say “STAND STRONG BERMUDIANS”. what did they think the govenor would do for blacks? seriously? who do you think he works for?